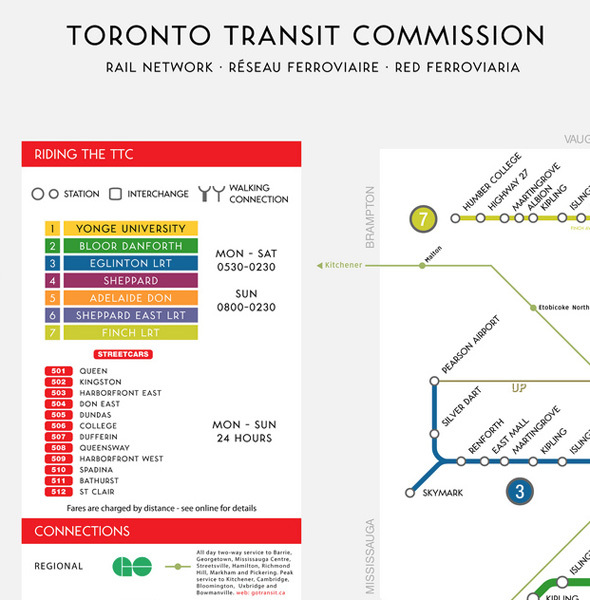 Ever wondered what a future version of the TTC might look like? Fantasy transit maps are a particularly popular past time in Toronto, I suspect, because there's just so much to hope for. So as our politicians dither on what route a Scarborough subway extension might take, transit and design geeks forge ahead in fantasy land to present idealized versions of TTC to make us cry and drool in equal measure. The latest of these maps that I've seen comes courtesy of Bryan Bonnici, who imagines what the TTC might look like 2054, a century after the opening of the Yonge Subway Line. You'll not that it's not actually that ambitious given the 40 year timeline. In addition to infrastructure additions that are already approved, this map adds a Downtown Relief Line (or the Adelaide Don line, as it appears here) and further subway expansion of north of the city. What prompted me to do this was how bad the official one has historically been," Bonnici explained in an email to us. "It's bad... because it doesn't show very important streetcar connections, nor GO connections, and with lots of new lines coming online in roughly a decade, this design will not be able to scale to show these lines. The TTC's been trying hard to rebrand themselves as a transit system worth being proud of, and I believe a well designed map is an important step in that direction. Let us know what you think in the comments. And check out a huge version of the map here.